The annual Sonepur Fair in Bihar is a vibrant rural fair that combines spirituality, sexuality, and animal trading. Street magicians, religious gurus and tantriks, pilgrims, snack stalls, handicrafts, amusement rides, circus performers, and dancing girls all create a carnival like no other. The fair is said to have ancient origins back to the rule of India's first Emperor Chandragupta Maurya, who used to buy elephants and horses from it for his army. The fair also commemorates the intervention of Lord Vishnu to end a great curse and long fight between elephant and crocodile in Hindu mythology. The elephant was saved, after bathing in the river and being attacked by the crocodile, by Lord Vishnu. Traditionally known as a cattle fair, trading of animals and birds is no longer the main focus at the Sonepur Fair due to wildlife protection laws. The number of the elephants at the fair has declined in recent years from about 90 in 2001 to none in 2017. There weren't any birds or camels at the fair in 2017 either, and only a small number of cows and buffaloes. The horse market still exists for now though, and equestrian performances have taken center stage. While still wonderfully off the beaten path, the Sonepur Fair now has a more commercial focus with the aim of attracting both domestic and international tourists. In order to facilitate this, Bihar Tourism took over its organization, including tourist accommodations, in 2012. In 2014, extra stalls were added, selling clothing, agricultural equipment, automobiles, and fast-moving consumer goods. A food plaza was also set up with branded national chains. In addition, there were various adventure activities. Sporting competitions, including martial arts, are to be introduced in 2018 to further draw the crowd. Cultural programs will also take place during the day for the first time. Where and When is the Sonepur Fair? The Sonepur Fair takes place in Sonepur, 25 kilometers (15.5 miles) north of capital city Patna. The most convenient way of getting there is to take a taxi for about 1,500 rupees. The fair commences on the auspicious Hindu holy occasion of Kartik Purnima (November 23, 2018), when pilgrims have an early morning bath in the river, and continues for a month. Most of the activities and animal trading happen during the first week of the festival. For the best experience, do be there on the first day to witness the sunrise bathing. You'll need to arrive the previous day, so that you can be up early for it. A stay of a day or two is sufficient to explore the festival. What really made the Fair remarkable and memorable for me was witnessing crowds of pilgrims taking holy bath at sunrise on Kartik Purnima, where the Ganges and Gandak rivers meet, to purify themselves and wash away any negativity. At around 5 a.m., head down to the river bank and hire one of the many boats that are lined up there. For 200 rupees (if you negotiate well), a boatman will slowly take you up and down the river for a couple of hours while you remain enthralled by the activities going on along the waterfront. Pilgrims pray and bathe amidst a background of chanting and the heady aroma of incense. Yet, it's the presence of ghost slayers and tantriks (performers of black magic) that really make it other worldly. The tantriks carry out their captivating and rather disturbing rituals to the intense and rhythmic beat of drums, as their eyes roll back in their heads, to ward off evil spirits. I sat mesmerized, as they led one devotee after another into the water to rid them of their problems. Despite living in India for nearly seven years and traveling extensively, I'd never seen a tantrik before. And, I admit, what I'd witnessed left me feeling a little uneasy but in awe of yet another part of India's mystical culture. (Are the tantriks real or just acting? That's for you to decide!). In my view, if you miss this riverside spectacle, you're missing out on the heart of the festival and may even find your festival experience to be unfulfilling. As an Indian photographer remarked to me, "It won't be possible to see these kind of rituals in 10 years, as India is modernizing at such a rapid rate." Tips: While you may be tempted to simply remain on the river bank and view the bathing from there, don't. It's much more powerful if watched from the river! 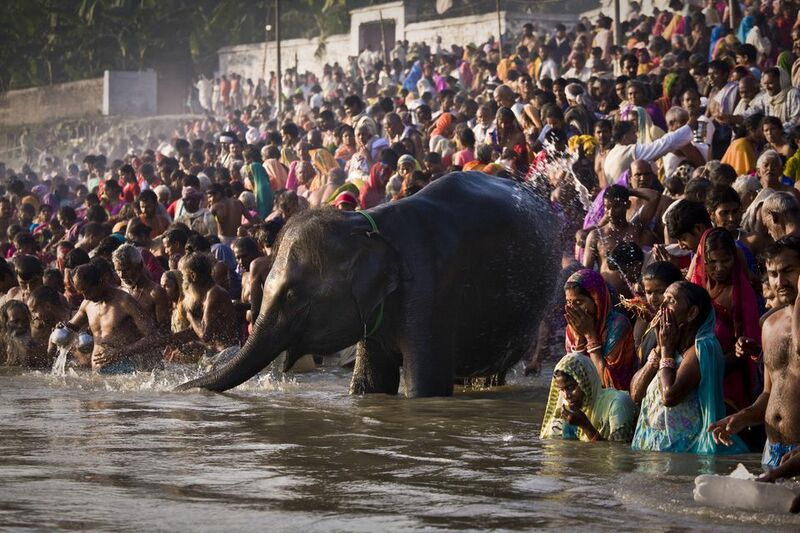 Elephants previously used to have an early morning bath in the river with pilgrims, and was a sight to behold. However, it's no longer possible to see this due to the absence of elephants at the fair. Do be aware that the reality of India means that sanitary conditions are very poor near the river, so watch where you walk. The Harihar Nath Temple in Sonepur, devoted to Lord Vishnu, is also popularly visited by pilgrims during the night and early morning of Kartik Purnima, after they've taken their holy bath. It's worth going there to see them flock to the temple with offerings of pots filled with holy water. So numerous in numbers, they're held back by police barricades. In stark contrast to these pious religious activities, "theater" performances are the highlight of nighttime entertainment for men at the Fair. Scantily clad women (commonly brought in from Kolkata and Mumbai) dance provocatively to music at various makeshift indoor stages across the fair grounds. Shows generally get underway from 10 p.m.
Bihar Tourism provides accommodations at the fair in the form of characterful woven straw huts with attached western bathrooms. The cost is 7,000 rupees per night, excluding food and taxes, during the first week. The rate reduces to 2,500 rupees per night during the second week of the fair, and 500 rupees per night during the third and fourth weeks of the fair. If this option is too costly (the huts are expensive for what you get and other options in the area are limited), you can stay in Patna and travel to the fair. Depending on the amount of traffic, travel time can be anywhere from around 30 minutes to an hour and a half. Bihar Tourism runs inexpensive day trips to the fair from Hotel Kautilya in Patna. To make travel arrangements and bookings contact Bihar Tourism by email on contactbstdc@gmail.com or bihartourism.tours@gmail.com, or phone (0612) 2225411. Alternatively, there are a few small hotels in and around Sonepur. Most are located in the vicinity of the railway station. Safety can't be guaranteed through. Bihar, while suffering from a negative image for many years, has greatly improved in terms of law and order. It's become one of India's fastest developing states and a growing tourist destination. I traveled as a single female and didn't feel threatened or anymore uncomfortable than anywhere else in India (although I was sensible and took proper precautions, including not staying out alone after dark). There's a heavy police presence at the Fair, and security guards at Bihar Tourism Tourist Village (where the tourist accommodations are). See photos of the Sonepur Fair in this Sonepur Fair Photo Gallery on Facebook and Google+. As is common in the travel industry, the writer was provided with complimentary services for review purposes. While it has not influenced this review, Tripsavvy believes in full disclosure of all potential conflicts of interest.